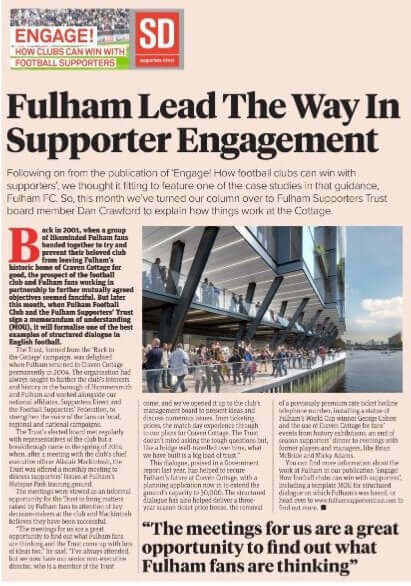 The Fulham Supporters’ Trust memorandum of understanding with Fulham Football Club, signed yesterday at Motspur Park, is featured in the January edition of fcbusiness magazine in article about how Fulham’s structured relationship is leading the way in British supporter engagement. The meetings for us are a great opportunity to find out what Fulham fans are thinking and the Trust come up with lots of ideas too. I’ve always attended, but we now have our senior non-executive director, who is a member of the Trust come, and we’ve opened it up to the Club’s management board to present ideas and discuss numerous issues, from ticketing prices, the matchday experience through to our plans for Craven Cottage. The Trust don’t mind asking the tough questions but, like a bridge well-travelled over time, what we have built is a big load of trust. The full article, made possible after the national umbrella body of supporters’ trust Supporters Direct kindly volunteered their regular spot in the magazine to showcase the Trust’s partnership with Fulham FC, can be found on page 65 in issue 106 of FC Business, which is on sale now. You can read a digital edition here. You can also read more on the history of our work furthering the interests of Fulham fans here.